Would the world of Onweald be the same if Enara had acted differently all those years ago? Join Chariss’s early ancestor on the shores that become Arcana. Rescue a dragon and flee a screaming horde of edras demons. Step into a fantasy realm where romance and humor meet sword and sorcery—where choices of the past shape the world of a powerful heroine. Step into What Choices We Made. DE: Do you keep a steady writing schedule, or do you have to “steal time”? SL: Thank you for your kind words. Coming up with a title is hit or miss with me. Sometimes it’s easy and the first part of a character’s story—the character is almost always first with me. When I wrote Chariss’s story, I didn’t come up with the title until I was writing a query letter to an agent and had to have something to call the finished work. Oops. So the name Choices Meant for Gods came about quite suddenly and because Chariss, the heroine, believes the decisions/choices she makes are better suited for the gods of her society. What she doesn’t realize, of course, is that as a protector of gods, she’s perfectly capable of making those big choices. The second novel in the series, Choices Meant for Kings, presented itself early on because there are two kings whose decisions affect not just their kingdoms, but also the direction of the war Chariss has to deal with. These people are messing with the future of their world. It’s not flippant stuff. 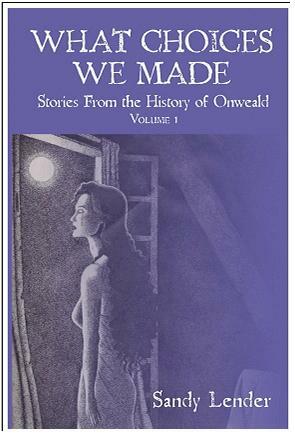 When it came time to name the short story anthology that I’m out promoting right now, I struggled a bit because, while each of the stories inside gave me its name as I worked on it individually, the work as a whole needed something that connected it to the Choices trilogy. It’s a collection of stories from that world and giving readers a glimpse into the background of that world through the eyes of some important characters, so it needed to imply that. What Choices We Made gives the impression of history. And then, of course, I had to tack on a subtitle to drive the point home. DE: Is any part of the promotion process intimidating or uncomfortable to you? Why, and how do you overcome it? SL: It can be intimidating when you get a mean person on the phone. Promoting the book is part of my job; I have to do it. So when I call up a book store to request time to come in and help them sell a bunch of books, it just irks me when the manager is rude or downright mean. I was going to be traveling to New York last summer, so contacted a couple book stores ahead of time to see if we could schedule something, and the managers were horrid. It’s frustrating because I’m offering to be a salesperson, for free, for a day. Maybe they’ve had a bad experience with an author in the past, but it’s unfair for them to assume that now every author should be treated like crap for even suggesting having an event that might increase traffic to their store for a day. You just have to hang up and dial the next store, hoping for a better person. DE: What’s the best part for you about sitting down to write? SL: Spending time with my characters. I adore Nigel and Chariss and I love the dynamic between Chariss and her wizard guardian, Hrazon. I never know what rant Rohne (the god) will go off on or how Chariss is going to settle him down, so getting into “the zone” and writing is fun for me. And I love the world I created for their story—now I just have to keep the bad guys from screwing it up. one particular catalyst, or did several inspirations gather for it? SL: Chariss was the catalyst. I started thinking about her story when I was in junior high and high school. The “bad guy” showed her to me. She’s been in danger since she was a child, but I knew there was more to this incredible young woman than just getting away from an evil sorcerer. My big “what if” was…what if she’s the most important person in her society and she’s been hiding out all these years? Well, what if she comes out of hiding? What if she stops running and stands up for herself? What if her enemy partners up with her god’s enemy? She suddenly has to make incredible decisions that she’s never even entertained before. One day she’s running from a madman with only thoughts of her own survival—the next she’s in charge of protecting a god from his insane evil mother…while still focusing on her own survival. It’s a lot for one chick to deal with, but Chariss is like no other heroine in fantasy literature today. She’s making choices meant for gods. You can visit Sandy’s blog, Today the Dragon Wins, here. Author devonellingtonPosted on November 17, 2008 November 17, 2008 Categories UncategorizedTags Sandy Lender, What Choices We Made, writing1 Comment on Interview with Sandy Lender! An entire week of blurbs, covers, and interviews with authors from Infinite Worlds of Fantasy!. The date is not set in stone yet, but I expect it to be up in early December. Author devonellingtonPosted on November 6, 2008 Categories UncategorizedTags Infinite Worlds of Fantasy, Karina Fabian, Nancy Hunter, Sandy Lender4 Comments on We’re Revving Up!